The trout stretches of Arkansas’s White and Norfork Rivers are “tailwaters”. That means that the level and flow rate of the rivers depends upon the water releases of the upstream dams. 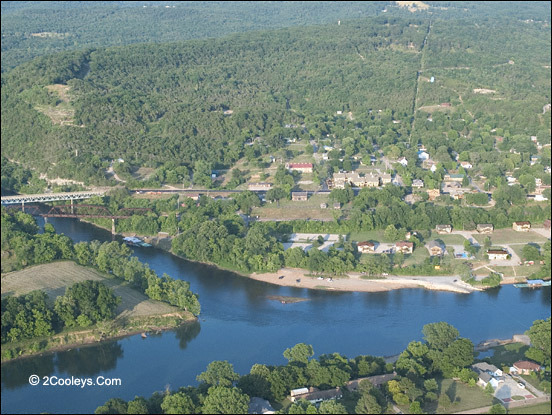 In this local case, these are the Bull Shoals and Norfork Dams. The amount of water released by a dam is dependent upon a complex calculation based on electricity requirements, season, and water levels behind the dam. This calculation rates an entire article of its own. As fisherman are usually only interested in the water level and flow today and what will they be tomorrow and the near future. There are three main sources for water level and flow information. The Army Corps of Engineers (COE) who operate the dams provides the “real-time” water flows and levels. The COE “real time” actually has a delay of about two hours. The Southwest Power Administration (SWPA) provides the forecasts for future operations. And “rivers cams” at various resorts on the rivers. Predicting Water Levels on the White and Norfork Rivers a generation of 0 mwh. An important point to remember in the case of generation schedules is that SWPA only shows schedules for one day in advance. So, you can usually see the schedule for today and tomorrow. On the weekends it will show the schedules for Saturday, Sunday, and Monday. The schedules are pretty accurate but are not set in concrete. The schedule for a specific dam may change due to the current weather or maintenance issues at another dam. Generation schedules are updated late in the afternoon. When you look at a schedule check the date at the top center of the page. A third source of actual, right now, real-time water level and flow information are river cams. Newlands has a cam that shows the White River fairly close below Bull Shoals Dam. Gene’s Trout Dock has cams that show the water level and flow on the Norfork right below Quarry Park and Norfork Dam. No matter what the schedule predicts you must always keep an eye out for water level changes. You might note the change by the change of the sound of the flowing water, noticing that a previously visible rock is no longer visible, or feeling colder water flowing against your legs. The water can come up very fast on the Norfork or below the dam on the White. If you see everyone else moving quickly to the bank, perhaps you should also! All this information can be fairly quickly found on Google. However, an easier way is to use the right smartphone app. A smartphone app is “White River Fly Fishing” provided by Dally’s Ozark Fly Fisher. The app runs on iPad, iPhone and Android. The app gives you easy access to current COE water flow data and the current SWPA generation schedules.